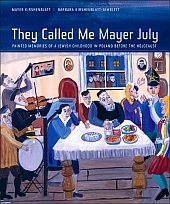 Check out Mayer in Yiddish on youtube. Will be posting regularly. First video is The Hunchback's Wedding. Mayer entered the exhibition and was stopped in his tracks. The sight of his paintings, so beautifully installed in blue rooms, just took his breath away. He was overcome with emotion. Click here for photographs of the opening. Those blue rooms, drawing from shades of blue in his paintings, set the images in a celestial space of reverie and reminiscence. The installation, a salon hang, created a wonderfully immersive feeling of being totally surrounded by the world of Mayer's childhood in Apt. Listen to the Guide by Cell tour of the exhibition. Many thanks to Shawna Silver, our ace sound editor. 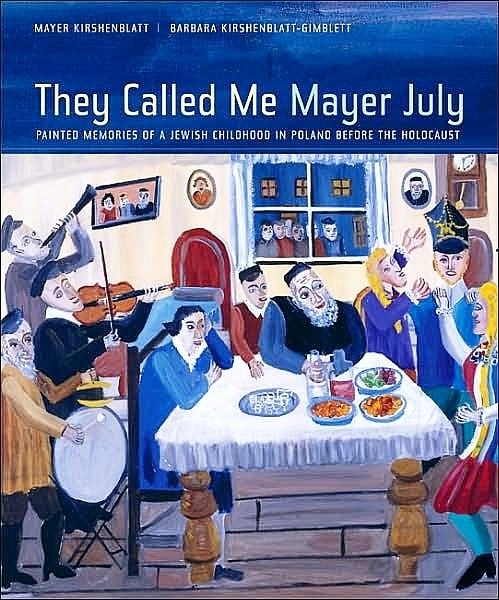 Watch a video of Mayer showing his paintings and talking about them at the book launch. 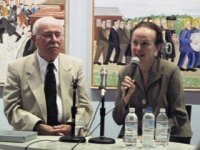 Watch a video of the Conversation with the Artist program on the day of the Magnes opening. Read the exhibition booklet, beautifully conceived by Faith Powell, who came up with the inspired idea to model this booklet on the marbled composition book that I used for this project. The exhibition will be on view at the Magnes in Berkeley through January 13, 2008 and will travel to museums in the United States, Canada, and Europe. To book the traveling exhibition, click here. Warm thanks to Chief Curator Alla Efimova, Executive Director Terry Pink Alexander, Curatorial Assistant Faith Powell, Director of Development James G. Leventhal, Curator of Eduction Carin Jacobs, Exhibition Registrar Julie Franklin, and the entire staff of the Judah L. Magnes Museum for all they have done to create this outstanding exhibition and the public and educational programs that accompany it and for all their efforts to bring audiences to see it. We are specially grateful to the Taube Foundation for Jewish Life & Culture and Shana Penn, Executive Director, for supporting this project. They Called Me Mayer July on youtube! 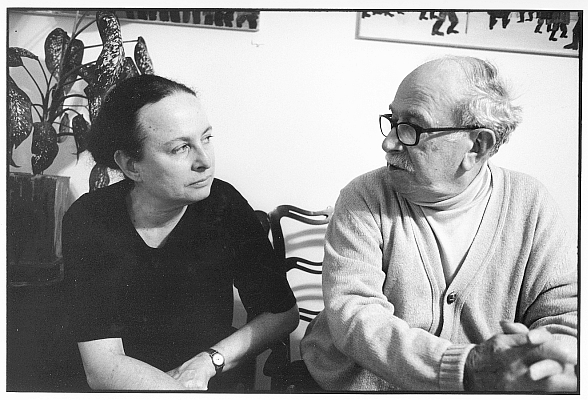 From Jack Kuper's Shtetl, a documentary about Mayer Kirshenblatt and his paintings.